A range of design and consultancy services offered by Stuart M Roy, including one-off designs, tank testing, taking-off lines, stability and powering calculations, surveys, technical investigations, documentation and FREE ADVICE. 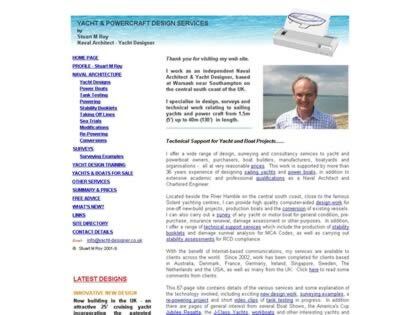 Web Site Snapshot: If available, above is a snapshot of the Yacht & Powercraft Design Services web site at http://www.yacht-designer.co.uk as it appeared when this site was added to the directory or last verified. Please Note that Boat Design Net has no involvement with the above web site; all content and images depicted in the above thumbnail are the property and copyright of Yacht & Powercraft Design Services unless otherwise noted on that site. Description: A range of design and consultancy services offered by Stuart M Roy, including one-off designs, tank testing, taking-off lines, stability and powering calculations, surveys, technical investigations, documentation and FREE ADVICE.